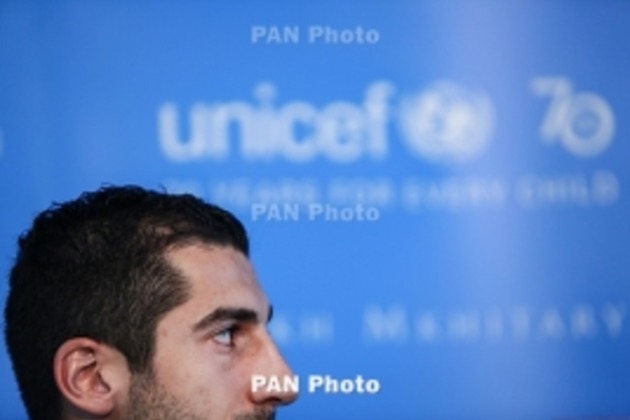 PanARMENIAN.Net - Midfielder of the Armenian national team and Manchester United Henrikh Mkhitaryan does not behave like a star, sports magazine Chempionat says. "He often appears on the stands next to Paul Pogba and David de Gea, but the ostentatious life of a celebrity is not about him," the publication says, citing ordinary, not extravagant hairstyle, modest interviews about football, love for family and homeland, as well as no scandals involving the Armenian playmaker. "The coolest player within the CIS, the midfielder of Manchester United does not live an unruly life. In any case, no camera in the world has recorded (such behavior)." Citing Mkhitaryan's deteriorated form in the past several weeks, the publication concludes that the midfielder who is turning 29 soon, doesn't like to be in the lead. Italian media reports suggest that captain of the Armenian national team and Manchester United midfielder Henrikh Mkhitaryan may head to Inter Milan in a swap deal that previously involved one of his team mates.